Video clip synopsis – 125 million sheep are spread across Australia. 90 thousand tons of lamb and 3 million tons of wool are exported annually. Australia truly rode to prosperity on the sheep's back. Broadband MP4 menmobs_bb.mp4 (4.6MB), suitable for iPods and computer downloads. 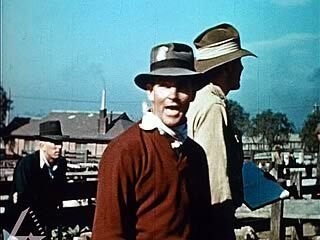 The Post War Wool Boom is an excerpt from the film Men and Mobs (20 mins), produced in 1947. Men and Mobs: Sheep and the Australian economy cannot be separated. Men and Mobs relates the growth of Australia’s flocks, starting with the few Spanish merinos that John Macarthur mated to the progeny of Indian sheep brought out by founder Captain Philip. Using song and anecdote, the film builds up the story of the men and mobs of sheep that provide fleece for our textile mills and materials for clothing a nation. Men and Mobs is a National Film Board Production. Produced by the Department of Information for the Commonwealth Department of Commerce and Agriculture. At Level 6, students analyse events which contributed to Australia’s social, political and cultural development. These events could include: WW 2. In 1945 World War 2 ended. The Australian economy had been greatly affected by the war. The disruption of international shipping had forced Australia to develop its own manufacturing industries, rather than rely on imports from overseas. However, Australia’s main export revenue still came very much from its primary products, with wool the most significant component. Wool at this time was the backbone industriy in the Australian economy. The post war wool boom led Australians into a brighter future. “We rode to prosperity on the sheep’s back.” It was this more secure financial environment which gave the baby boomers a start to a far easier life than their parents. Sheep, drovers, stockmen and the Kelpie dog are a rich part of our cultural heritage. Waltzing Matilda is our alternative national anthem. Sheep and the environment have been the subject of many Australian paintings. Our fine merino wool is used in sought-after fashion wool garments here and overseas. What is your image of the ‘environment’? Record your ideas in a list of single words or short phrases. This will give you an indication of your own definition of and values towards the environment. It will be a modern one. Watch the video clip with the sound turned off. List your reactions and impressions, in single words or short phrases, particularly to the scenes showing the environmental activities shown. Now watch the clip again with the sound on. What are the main messages of the video clip? If your own ideas are different from those actually presented in the video clip, try to explain why. What messages are being presented in the video clip? What are the main values that are underpinning those messages? How do the filmmakers persuade you to accept or adopt the messages? Consider such elements as the music, the type of shots used, the narrative. What overall image of Australia is being presented? Is this video clip propaganda? Decide on a definition of ‘propaganda’ and apply that to the video clip. After viewing this clip, what sort of impact would you say that WW 2 had upon Australian society? The video clip focuses on the economy and the environment. What is the attitude to the environment that is implicit in the video clip? How is it different from your attitude to the environment as expressed in your original list of words and phrases? Imagine a conversation today between a person of the 1940s and a person today about the environment. How would the points of view differ. Are there ways in which their views might be similar? Imagine that you were creating a video clip today about an economically sustainable sheep industry in Australia. What aspects would you show that are not shown in this video clip? A conflict exists between economic development and environmental sustainability. How do we decide the balance between the two? Prepare a statement or definition that can guide people in balancing the two. Compare your definitions with those of your classmates, and see if you can develop one that suits all. Most people in the 1940s would have had no idea that their attitudes towards the economy and the environment would change so much over time. Can you imagine any aspect of your values and attitudes that are commonly accepted today that might change dramatically over the next several decades? For example, might attitudes towards eating meat change dramatically in the future? Or attitudes towards car use? Or attitudes towards nuclear power? Discuss any possibilities as a class.